Why The Justice Department's Eyes Are Upon Texas : It's All Politics In the war over the right to vote in the U.S., the Justice Department's choice of Texas as the battleground for its first legal action following the Supreme Court's weakening of the Voting Rights Act has a feeling of inevitability. 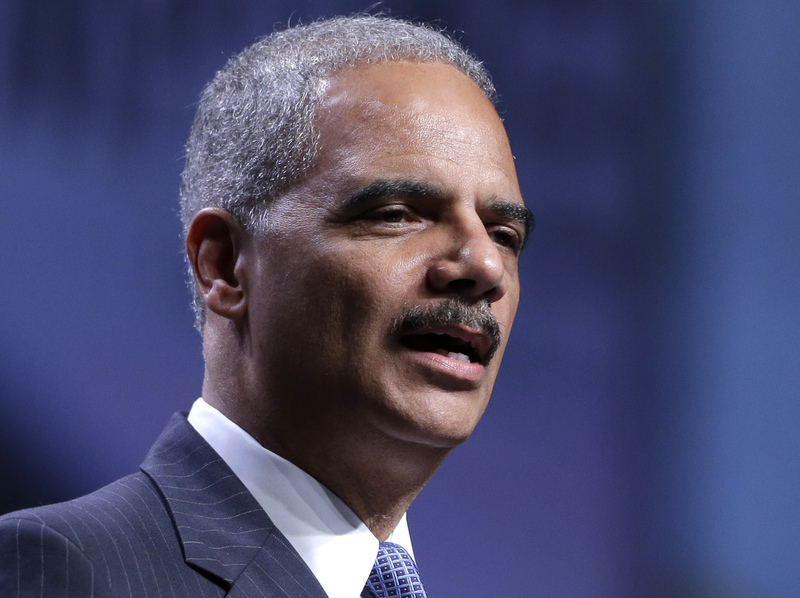 Despite a Supreme Court ruling that gutted a key part of the Voting Rights Act, Attorney General Eric Holder wants a court to use another section of the 1965 law to require Texas to get the federal government's approval before changing its voting laws. In the war over the right to vote in the U.S., the Justice Department's choice of Texas as the battleground for its first legal action following the Supreme Court's weakening of the Voting Rights Act has a feeling of inevitability. Texas, as its natives are always boasting, is exceptional. And that's certainly true in this sense: It has the largest Hispanic population of all the states previously required to get the federal government's approval before changing voting practices. And Latinos are not only one of the fastest-growing groups in the U.S. but one whose political allegiance tilts heavily toward Democrats. Indeed, as we've reported here at NPR, if Texas goes from being a red to a blue state in coming decades, it will be largely due to the growing numbers of Latino voters. The Lone Star State, which caught the Justice Department's attention with a voter ID law that the federal government stopped from going into effect in 2012, was quick on the draw after the Supreme Court's ruling last month, which largely defanged the 1965 law. After the ruling, Texas Attorney General Greg Abbott said the state would move forward ASAP with its redistricting plans. Given all that, why not make Texas the first state to be challenged by the Justice Department under what remains of its enforcement powers under the Voting Rights Act? A month ago, Attorney General Eric Holder foreshadowed the lawsuit, which he announced Thursday at the National Urban League conference in Philadelphia. Just hours after the U.S. Supreme Court released its Shelby County v. Holder opinion, Holder said the administration would use "every legal tool that remains available to us." The Justice Department is now asking a federal court in Texas to require the state to get pre-clearance for changes to voting laws under a section of the Voting Rights Act that wasn't at issue in the Supreme Court ruling. And while Texas is up first, states like North Carolina, Florida and Louisiana just had the equivalent of a shot fired across their bows. Rick Hasen, one of the nation's leading election law experts and a professor of law and political science at the University of California School of Law, Irvine, called the Justice Department move a "big deal" in a post on his "Election Law Blog." It means that DOJ is going to move aggressively to try to restore what it can of the preclearance regime the Supreme Court effectively gutted in its Shelby County decision. Covering Texas would be a big deal, but it is nowhere near what existed before Shelby County. If the three-judge court goes along, the issue could well end up back before the Supreme Court, perhaps even this coming term, to possibly kill what remains of preclearance. The Justice Department now invites the possibility of another Supreme Court voting-rights decision, which could go against it, Hasen suggests. But the Supreme Court didn't leave the administration a lot of options. So it sued Texas, a move which also pits the Democratic Obama administration against the keystone of red-state America, the home to some of the nation's best-known conservative politicians, like once and perhaps future presidential candidate Gov. Rick Perry. Perry issued a statement accusing the Justice Department of attempting an "end run" around the Supreme Court. On Thursday Abbott, who's running for governor, tweeted: "I'll fight #Obama's effort to control our elections & I'll fight against cheating at ballot box." The "cheating" remark was an allusion to new voter ID restrictions the state plans to implement that previously would have needed the feds to sign off on. Perry's and Abbott's reactions should galvanize Republicans; the Obama administration's actions will do the same to the Democratic base. The federal lawsuit clearly gives the administration fresh ammunition to argue that Democrats, not Republicans, seek Latino political empowerment. In its legal filings, the Justice Department joined the Texas House of Representatives' Mexican American Legislative Caucus among other parties in the lawsuit. That's not to say Justice Department officials weren't operating from what they viewed as pure motives. But the practical political benefits couldn't be ignored. Administration critics saw the legal action as little more than a cynical political power play. This announcement is all about the midterm elections. Obama wants the House back, and the Justice Department is again being turned into a political weapon using the cloak of civil rights. This has become the new civil rights model. Because Democratic interests are so perfectly aligned with the civil rights establishment — in no small measure because of extreme bloc voting by American blacks — the DOJ is now an arm of the DNC.